A painter and a draughtsman known for figures and portraits, Bernard Fleetwood-Walker RA was born in Birmingham in 1893. His father William Walker was the co-inventor of the Walker-Wilkins battery, and his mother Electra Amelia (n&eacute;e) Varley, the granddaughter of the 19th century watercolourist Cornelius Varley. Beginning his career as a silver and goldsmith, he went on to study painting at the Birmingham School of Arts and Crafts, then in London and Paris. During World War I, Fleetwood-Walker continued to make work, despite being wounded and gassed whilst serving in France as a sniper in the Artists Rifles. Postwar, he taught art in Aston and left in 1929 to teach at Birmingham School of Arts and Crafts. He exhibited regularly at the Royal Academy from 1925, had a major solo show at the Ruskin Gallery, Birmingham, and won a silver medal at the Paris Salon. 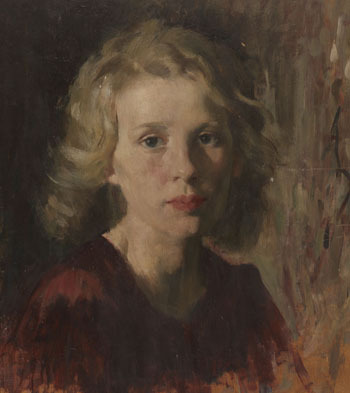 During the 1950s he taught at the Royal Academy schools, becoming Assistant Keeper under Henry Rushbury and being elected both an Associate of the Royal Academy and then a full member in 1956. Fleetwood-Walker died in 1965. Bernard Fleetwood-Walker, Avril, c.1952. Oil on board 16x14inches. Rowntree & Co. Ltd archive at Borthwick Institute for Archives. By permission of Nestl&eacute; UK and Ireland. 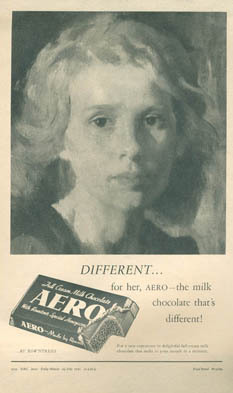 Fleetwood-Walker painted at least one Aero Girl commission for J. Walter Thompson (JWT), which was published in the Daily Mirror during July 1952 and is now held in the Rowntree & Co. Ltd archive at the Borthwick Institute for Archives. The sitter of this portrait is remains unidentified. Painted roughly, oil on board, the head and shoulders portrait of a fair-haired woman bears a striking resemblance to his other paintings of female heads from the late 1940s and early 1950s in the collections at Museums Sheffield and Royal Birmingham Society of Artists. The warm palette and broad, loose brushstrokes are characteristic of Fleetwood-Walker's portraiture during this period. His invitation to paint a commission for JWT would have come from his Royal Academy colleague Henry Rushbury, Keeper of the Royal Academy Schools. Rushbury was a close friend of George Butler, then Head of Art at JWT and also in charge of the Rowntree Aero advertising account. Fleetwood-Walker would have also been a tutor to student Aero artist Raymond Gabbott at the time of painting this portrait. BBC/Public Catalogue Foundation. Bernard Fleetwood Walker. Retrieved 7 March 2014.